A 'Verruca', which is also known as a Plantar Wart is not a pleasant terminology, it is not a very pleasant condition to have either. However, it is a common infection and affects most of us at some point in our lives, more common in young children than adults though. It is a Virus and it is contagious, and it should not to be confused with athletes foot which is a fungal infection of the foot and is non contagious. This viral infection is commonly picked up from, or caught from public 'wet rooms' a communal shower room, locker room showers, public bathing areas etc. As these are the conditions the virus survives in. If the sole of the foot is damaged in any way it can present an 'open' door or invitation to the virus. It is therefore advisable to wear some form of foot protection in these cases. athletes foot treatment as well as relaxing and healing any damaged skin. Verrucas or Plantar Warts are generally found on the part of the foot that bears the body weight, (the area of the foot which is in contact with the floor. Sometimes not noticeable, the virus can lie dormant (within the skin) for many months giving a false idea of where it was contracted. The Plantar Wart may then appear on the sole of the foot in the form of a small white spot, something like a blister, with smaller black spots within it. (see photo). They can become painful to walk on as they usually are on that part of the foot where pressure is applied but the good news is they can be treated. Verruca Treatment can vary from prescription drugs and creams to 'over the counter' creams, depending on the severity of the condition. They can be 'frozen' off the foot using a liquid nitrogen spray. 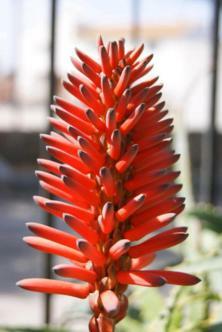 They can be removed surgically (which is generally not advised) as the condition could return. Or they can be treated externally using creams and ointments. Other ways are to gradually remove the dead skin around the infection and apply, daily, new ointment or specialist creams. In all of this it must be remembered that Verrucas are contagious so cleanliness and hygiene are very important for the virus not to spread locally or to others. Use your own towel when drying you feet. Always keep towels seperate and away from other members of the family, and clean and wash them regularly. natural cure to the insides your shoes. If you must use a communal changing room or shower room then it would be wise to wear 'flip flops' or some kind of shower room shoes for protection. and others from contracting the virus. These Plantar Warts can be left untreated to go away on their own. They can infect your foot for a few months then just dry up drop off on the darker side though they can last some years. Personally i like to have them treated using creams and natural antiseptics. 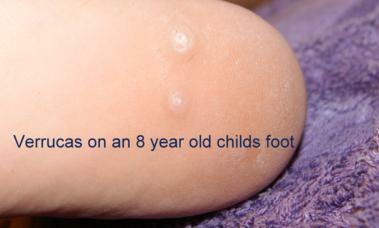 The above photo is of an 8 year old girl who was suffering from verrucas. She had 2 verrucas on one foot and 3 on her other foot. We treated her by washing her feet in warm water with a few drops of lavender oil added. The foot soak lasted for around 10mins then dry the feet seperately with a clean towel for each. Then as much as possible of the dry dead skin was gently removed (by a Chiropodist) using a clean sterile scalpel. Never break the skin or cause a wound when doing this. Then apply the treatment directly on to the foot wart. We used Tea tree oil. This clearing of the dead skin is essential so that the treatment can penetrate to the root of the verruca. Then a good foot cream can be massaged into the whole foot and toes. We use Sole Solution by Nu Skin, and we think it is the best foot cream available. This type of treatment for verrucas should really be done daily to have the desired effect of killing and removing the foot wart. If it is a new wart this treatment can take weeks to finally and completely remove . If it has been there for some time then it can take months of this treatment to kill and remove the plantar wart. So it is important to take it as soon as you detect it. It is always best to seek the advice of your Doctor or Chiropodist or course before embarking on any treatment of any kind especially where the use of a scalpel is required. 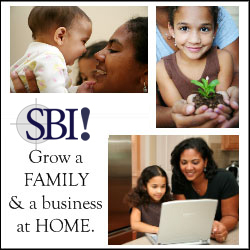 S.B.I helps you to take your hobby your knowledge or passion and turn it into an enjoyable and profitable Home Business. With amazingly helpful forums the energy from fellow S.B.I ers drives you on to success, click on the S.B.I. box above to take a look. This just could be the break you have been looking for. Sell your photos to Dreamstime. A Photo publishing site. We have a growing following and pride ourselves in providing the best advice and products for Toenail Care and Healthy Feet.